The morning shave is an important part of man’s day, and a shaving cream or a gel is often a key item in a grooming routine. 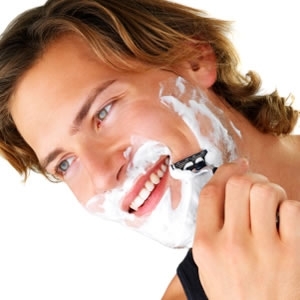 Most shaving products contain ingredients that irritate his skin and speed up premature aging. Each shaving gel contains a hefty dose of potentially carcinogenic and plain irritating chemicals, such as triethanolamine, various propylene glycols and paraben preservatives, mineral oils, butylated hydroxytoluene (BHT), synthetic dyes and fragrances. Can’t believe things are this bad? Let’s take a look what contains in the most popular shaving gel, Gilette Series Shaving Gel. The essential product in the morning routine contains skin irritants and potentially carcinogen triethanolamine, carcinogenic colorants (BHT, FD&C Blue No.1, banned in Austria, Belgium, Denmark, France, Germany, Greece, Italy, Norway, Spain, Sweden, and Switzerland) and central nervous system toxins and pollutants (isopentane, isobutane and synthetic fragrance). It is a common belief that harsh ingredients such as alcohol, menthol, and camphor, assist shaving by irritating the skin, forcing the minor swelling to raise the hair follicle up and away from the skin. The raised hair allegedly helps for a closer, smoother shave, but in fact men do not reach the very base of the hair because swollen skin doesn’t allow the razor to glide on the skin surface. Most often, what looks like an impeccably smooth skin is actually swollen skin, and as soon as the swelling starts to recede, the stubble shows up. Some hairs will get trapped under the swollen skin, and as they regrow they form painful bumps with ingrown hair. To add insult to injury, men like the feeling of a cooling, tingling feeling of an aftershave as they splash it on after the shaving. What happens in reality? The freshly scraped, swollen skin is irritated by harsh alcohols, menthol, propylene glycol, and synthetic fragrances in the aftershave. When men think they soothe and kill bacteria, they are in fact irritating and burning their skin. The number one rule of a green shave: nothing should burn, irritate or even tingle. There are many effective shaving gels and creams that may not produce a thick, rich foam but nevertheless aid in a really close, non-irritating shave. Tom’s of Maine Natural Conditioning Shave Cream and Herban Cowboy Premium Shave Cream are all good choices. Weleda Shaving Cream is a multi-purpose buy: based on pure vegetable soap and natural oils to produce a really creamy lather, with sweet almond milk and organic goat milk. I’ve even converted my daughter to using it for her legs!” says Weleda’s Roger Barsby. Another elegant way to make the shaving routine more skin-friendly is to introduce your man to the classic shaving kit consisting of a natural-bristle brush and a soap bowl. They come complete with a stylish stand for the brush and a razor. This way, your man can use some of the greenest shaving solutions out there is a plant-based, nourishing shaving soap. You can choose a regular olive-based round soap that fits in a bowl or you can buy a separate bowl complete with a natural soap, such as I Coloniali Shaving Cream that comes with a refillable terracotta pot. Just because a shaving product is made of plant extracts and juices doesn’t mean it’s automatically the safest. Menthol, peppermint, citrus oils, camphor and eucalyptus can irritate skin and cause rashes and redness. Instead, look for soothing, calming ingredients such as aloe vera, green tea, chamomile, plant glycerin, oat and milk proteins, rosemary, calendula, St. John’s Wort, hyaluronic acid and panthenol (vitamin B5). As always, avoid hidden synthetic chemicals. No matter how natural the product sounds, if it contains triethanolamine, petroleum-derived silicones, artificial fragrances, and paraben preservatives, it’s not truly green and is not much different from the shaving gels sold in your local convenience store. Careful shaving includes a good, green aftershave. Suggest using a non-scented, slightly astringent facial toner instead of a traditional heavily-scented aftershave. Dr. Hauschka Clarifying Lotion and Primavera Tea Tree Floral Water are unisex, all-natural toners that aren’t feminine in design and are strong enough to please a man who has used to splashing his face with Old Spice since his high school.